The Lenovo P2 measures 153 x 76 x 8.3mm, which is about the same as the Vibe P1, only 1.5mm thinner. At 177g, the phone is also 12g lighter than the P1, which is great, considering all the upgrades, which even include a bigger battery. As we already pointed out, the Lenovo P2 is hiding numerous upgrades on the inside, but you would be hard pressed to spot any on the outside. The design is one area where Lenovo took a quick shortcut by borrowing whatever they could from the P1 without much change. Indeed, the P2 has an identical design with the Vibe P1. Not only that, but we've seen this design reused numerous times already even in phones by other manufacturers. The metal back with plastic strips on the top and bottom for hiding the antennas - the mid-range segment is full of devices using this arrangement - especially the more affordable lot. You've probably noticed the small accent line bridging the camera's indent with the top strip's contour. Some might see a reference towards the HTC One, but it's been here since the Vibe P1, and it adds some much-needed character to the P2 design, so we don't mind it at all. As you've already noticed, our review unit is the golden P2. The screen bezels are all done in the same gold paint job as the rest of the body. The two strips on the back look a tone different from the chassis' paint job. We like the two chamfers running around the frame. They help with the grip, but represent a design feature, which is all too common (and not among expensive devices). Handling the Lenovo P2 is business as usual - it's a well-built device, quite sturdy, so it feels secure in hand. With promising hardware specs like these, only the unimaginative design is what would set it back from becoming a bestseller. 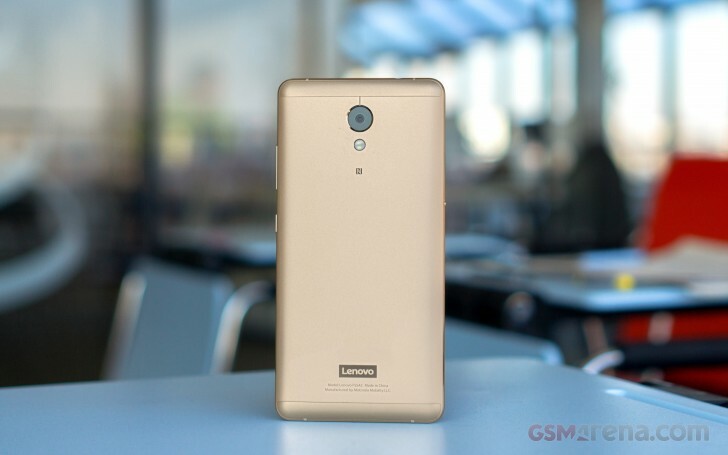 Lenovo P2's front is rather ordinary - a big chunk of it is occupied by the 5.5" Super AMOLED screen. Above the screen is the earpiece, flanked by the 5MP selfie snapper and a couple of sensors. There is LED notification light on the right side of the selfie camera. The LED is customizable, and you can pick the color for several different types of notifications. You can also have it enabled on a fixed schedule, so it doesn't light up in the night, for instance. Below the screen is the Home key with an embedded fingerprint scanner on its surface. The sensor is always-on and would wake the phone as soon as you touch it with a registered fingerprint. It's fast to react, but it's not terribly accurate. We found that you have to be mindful of the direction and position in which you rest your thumb over it or else it would fail the reading. Of course, your mileage may very. You can opt to hide the on-screen Android keys, and use the Home key for two-step navigation very similar to Meizu's mTouch home key. Once you get rid of the virtual controls, you can navigate through the OS with a tap for Back and a click for Home. On the left-hand side of the phone is the hybrid card tray - it can either house two nano-SIM cards, or a single nano-SIM and a microSD card. It isn't the ideal solution as you can't use two SIM cards and a microSD card simultaneously, but it has established itself as the solution preferred by manufacturers, so we'll have to learn to live with it. There is also a tiny switch below the SIM tray, which activates the dedicated battery saving mode in an instant. In this mode, the phone's features get severely limited to the duties of a regular phone so that you get the most out of the remaining battery charge. While we appreciate the practicality of this mode (many other manufacturers offer it), we certainly don't think it warrants a hardware switch of its own - not with a battery as big as the one in the P2 and certainly not when it's so easy to toggle the mode with a software shortcut. Furthermore, the switch function is not customizable, so you are stuck with it operating as it does. The top of the Lenovo P2 looks quite busy, but that's an illusion. The main points of interest here are the audio jack and the secondary mic. The bottom is where the microUSB port is accompanied by two grilles - one for the primary mic and another one for the loudspeaker. Finally, turning over the P2 to explore its back, we find the 13MP camera lens on the back. It has a f/2.0 aperture - wider than on the Vibe P1 - and it comes paired with a dual-tone flash. You may also notice the Lenovo logo, and the fine print, which says the P2 was manufactured by Motorola Mobility, which is an interesting twist to this story. We've always imagined that Lenovo is the owner of Motorola and it's more like Moto phones are made by Lenovo. and not the other way around.